Islamabad– State Bank has removed the 10% limit for banks for giving loans to real estate / housing sector. Federal Government is planning 5 lac housing units for low income peoples in next 5 years. This step has been taken in view to facilitate low cost/low income/affordable housing project under Government Housing schemes. a) Individual/family owned houses for the purpose of self-occupation or renting out (non-commercial usage). b) Builders, developers, contractors, corporations, property dealers and any other person dealing in residential, commercial and industrial real estate, e.g., undeveloped land, housing societies/residential buildings, office buildings, multi-purpose commercial premises, hotels, shopping malls, retail space, retail store, buildings, industrial space, factories, warehouses. Please refer to the BPRD Circular No. 01 dated January 02, 2014 on the captioned subject. 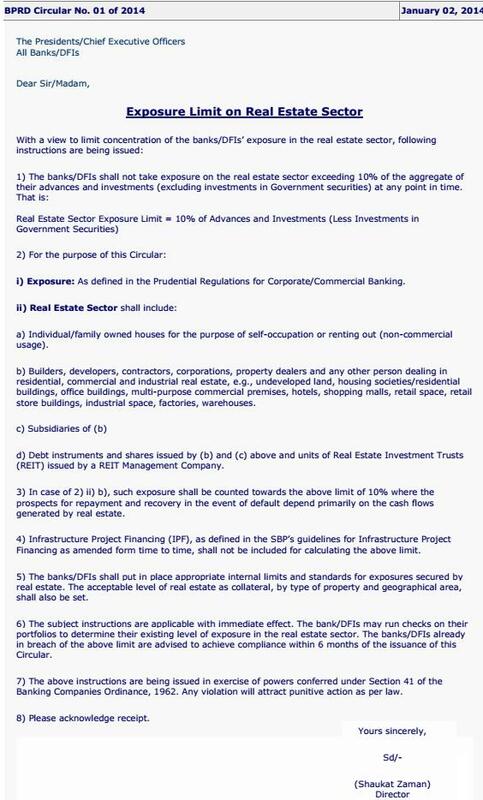 1) With a view to promote the low cost/low income/affordable housing, the limit of 10% as notified in the above referred circular will not be applicable on financings under Government Housing schemes and initiatives. 2) It is further clarified that by linking exposure with the advances and investments (net of Government Securities), a substantial cushion is available to the banks for promoting housing finance. 3) All other instructions will remain unchanged. Earliar a State Bank issued a circular to imposed loan exposure limit for Real Estate Sector of 10% to all commercial banks.